With Amara Menu and Button Maker™you can create professional Adobe® Flash® Player compatible Flash buttons and Flash menus that can be inserted into any website in a snap. scrolling menus and sub menus in minutes for your website or Flash project. All our software apllications allow you to combine the created SWF files. Check out this web menu, which got a banner as a background animation added to it. Funky! Amara Menu and Button Maker™is extremely user-friendly, you will understand how it works immediately. No Flash or programming skills are required. 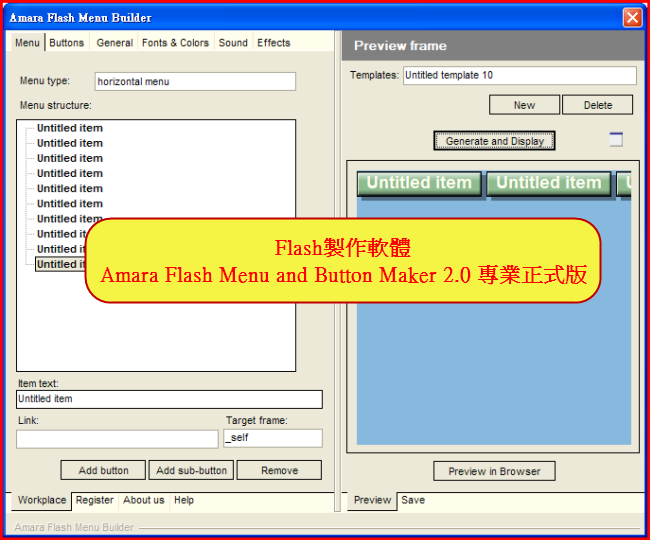 Amara Menu and Button Maker™ allows you to create Flash menus with an unlimited number of buttons. You can also add sub menus and each button can be scaled up to the length of the button text entered. you can choose your own color to match the specific color of your website.